Customers want an operationally viable solution to improve their existing x-ray systems and keep them current with the evolving threat. They want to combine hardware and software in a unique solution to discriminate, quantify and identify materials without the penalty of a high false alarm rate that leads to reduced throughput and passenger facilitation. Working closely with its partners, MultiX is ready to offer the ME-ATD algorithm to improve ATD for security applications. The MultiX ME-ATD algorithm runs in concert with the MultiX ME-100 data acquisition system (DAS) to provide state-of-the-art automated threat detection for both solid and liquid explosives. The ME-ATD algorithm can be installed on any existing transmission X-ray system (XRT) with ATD (single, dual or multi-view) providing it has been retrofitted with the MultiX ME-100 DAS. The ME-ATD takes full advantage of the high resolution spectral information generated by the ME-100 to provide compliant solid and liquid explosives detection performance at very low false alarm rates without any reduction in throughput. The ME-ATD improves the image segmentation steps of the threat detection algorithm to ensure objects are correctly identified and then refines the object classification based on analysis of the complete attenuation spectra. 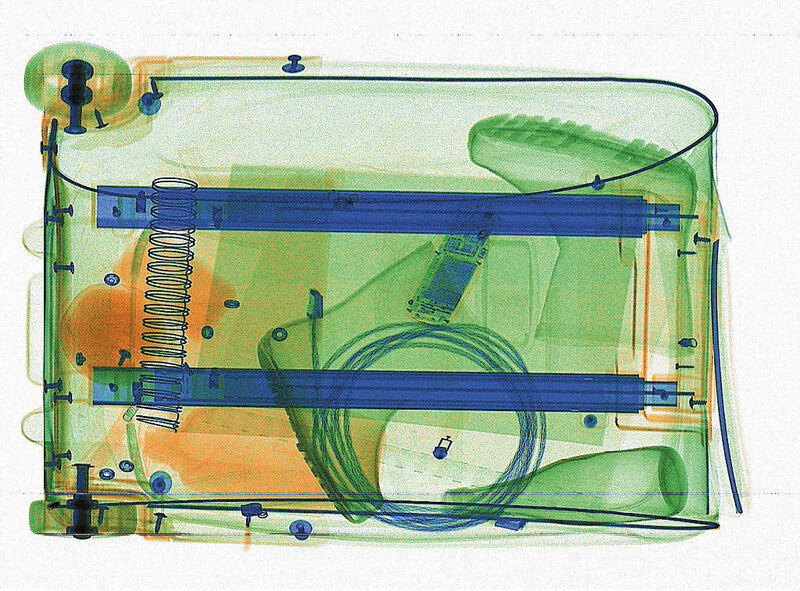 This enables materials, for example home made explosives (HMEs) with very similar X-ray attenuation properties to benign materials to be distinguished even in complex bag situations leading to much improved detection and false alarm rates. Existing OEM algorithms based on conventional dual energy DAS are limited in performance by the lack of accuracy and precision afforded by the detectors themselves and hence can never approach the performance levels demonstrated by the ME-ATD algorithm used with the ME-100 DAS. Runs on existing OEM host computer with no image processing throughput penalty. Has a flexible configuration and can run on single, dual and multi-view systems (when upgraded with the ME-100). Offers an upgrade path to existing systems via a retrofit with the ME-100 and therefore extends the life of existing systems. A factor 3 reduction in false alarm rate when the ME-ATD is applied to divested liquid, aerosols and gels (LAGs) screening compared to existing dual energy based algorithms. Detection rates above 90% with false alarms less than 5% has been observed in operational-like conditions. The meat industry is a very demanding application from a process and quality control perspective where relationships between stakeholders are crucial, not only for quality but also for mutual benefit and profitability. Global competition pushes slaughterhouses to demonstrate their capabilities to deliver accurate fat content percentage across all product classes. The fat content percentage is often key to maintain a good recipe for food transformers. Therefore real time traceability, quality and other contractual obligations, when delivering batches of raw materials is a must. Usually this industry uses either the Soxhlet method which is non-real time or NIR technology which is but is limited to thin meat products to measures fat percentage, however these techniques have limitations. To gain competitive benefits it is advantageous to measure accurate fat content of 100% of the product in real time. X-Ray systems allow real time fat percentage measurements (Chemical Lean, CL) and also identify potential contaminants such as glass, steel, bones, rubber and/or others, in particular when the thickness of the meat is variable. For more than a decade, x-ray system manufacturers have provided solutions using dual energy technology for CL measurement. These systems are capable of measuring CL at an accuracy of 1% on pieces of meat around 20 kg. The advanced MultiX FAT-X algorithm used in conjunction with the MultiX ME100 multi-energy data acquisition system, gives a complete turn-key solution for meat processing. The MultiX FAT-X and ME100 can measure CL to an accuracy of 1% between 5 to 70% of fat down to cuts of meat less than 1kg compared to 20 kg for similar accuracy with dual energy systems. 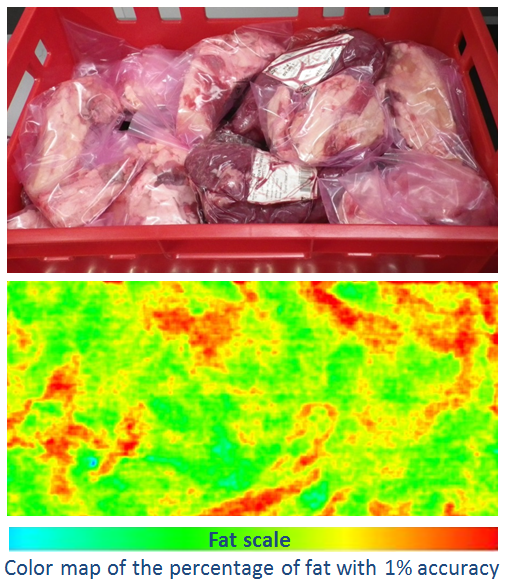 With these capabilities, multi-energy x-ray technology can be applied to the meat industry to measure the recipe quality and to detect foreign body such as bones or mechanical contaminants. The benefits are available in real time with no interruption to the process flow. With more and more regulations to protect the health of the end customers, the MultiX FAT-X algorithm used together with the MultiX ME100 ensures your x-ray system and meat processes to meet the new challenges in this industry. Beyond the fat percentage measurement the MultiX ME100 quantifies salt, aluminum alloys or ores with similar approaches. MultiX provides smart x-ray spectrometric detectors giving advantage over single or dual energies scintillators and also over counting detectors for many applications. Scintillators are usually capable to separate material based on density or/and thickness. In transmission, ME100 brings a high value by adding up the capability to capture all the features related to the atomic composition of the material. To get the maximum benefits of the ME100 features, several multi energy algorithms are ready for integration in x-ray spectrometric scanners in particular when discrimination or identifications are required to sort out material in added value applications. ME-Sorter 1D algorithm, when associated with ME100 detectors, analyzes the scanned material and gives a distance value from a reference material. The algorithm gives the distance with a selected threshold (e.g +/- 2 sigma) scale from this reference material. This useful algorithm enables to discriminate unexpected/contaminant material from the reference material. For example, in food application, you have safe bulk material used as an ingredient for a recipe. When the bulk material varies from the initial reference, you should have suspicion that unexpected variation is due to foreign bodies or that a process change is ongoing. As controlled process variations could happen along the regular process flow, the algorithm has several thresholds that could be used as tolerance variations. The multi-energy spectrum measured by the ME100 gives a much better accuracy than any others including dual-energy systems, therefore the precision of the discrimination and process monitoring allow a much accurate and precise information. ME-Sorter-1D allows discriminating corrupted materials from a referenced material. Applications such as recycling takes benefit of ME sorter 1D to sort out or trim process flows. For glass sorting, recycled material can mixed up various glass types on the conveyer belt. Assuming the requirement is to extract from the bulk only the soda glass. Customer selects soda glass as reference. Therefore unexpected glass types can be removed and a purified soda glass is recoverable even in a dirty environment. For food application, bone detection in chicken filet is a mandatory item for food makers. When a chicken filet is scanned with the ME Sorter 1D the meat becomes the safe reference ingredient. From then on all other materials including bones and soft bones becomes a contaminant and is automatically identified. Many other applications can get benefits of ME100 and ME sorter 1D algorithm in other industrial activities. ME-Sorter 2D comes in addition to ME-Sorter 1D and is designed to exploit the multi-energy benefits with a better accuracy compared to dual energy detection. When the level of performances of the dual-energy detectors based on scintillator limits the ability of discrimination/identification of elements, the ME100 combined with the robust ME sorter 2D algorithm provides a much more accurate atomic composition (Zeff indication) information. ME sorter 2D uses an innovative methodology to deliver an accurate information on the atomic composition based on a dedicated calibration. The great precision and accuracy of the measurement allows a robust discrimination for sorting material in mining, recycling or contaminant identification in several food products applications. Many other applications can also benefit from MultiX ME 2D algorithm. ME-Sorter-2D provides an accurate and precise Zeff measurement and its therefore able to discriminate materials. When minerals get large differences in density and or in effective atomic number (Zeff), conventional systems can discriminate differences among stones. However when the nature of the mining process requires separating various stones with smaller density and or atomic composition difference then conventional system becomes limited. ME100 X-Ray multi-energy detector associated with ME-Sorter 2D opens new area for mining companies. MultiX solution enables discriminating such materials taking into account thickness variations. MultiX has demonstrated the benefits of such a combination in XRT systems. With the increasing scarcity of some raw material, the recycling process is more and more demanding to benefit from the valorization of the material collected back. In this sector, ME Sorter 2D algorithm when using ME100 acquisitions enables new recycling applications not feasible until now by dual energy systems. MultiX solution has demonstrated benefits for metal, aluminum or glass sorting. Several other applications such as plastics doped with flame retardant can also be addressed with future MultiX multi-energy x-ray detectors and ME Sorter 2D solution depending of the operational conditions.